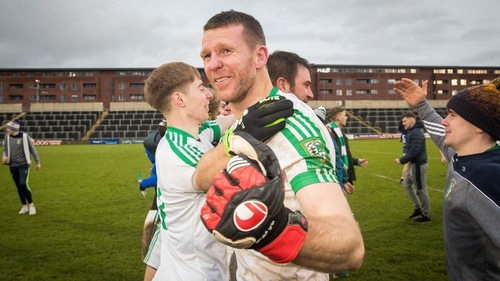 Moorefield veteran Ronan Sweeney says the dramatic fightback to claim a Leinster club football title topped all his previous achievements as a footballer. The 37-year-old was a key figure as the Kildare champions toppled St Loman’s after trailing by six points with six minutes remaining in Portlaoise. Moorefield plundered 1-04 in the closing stages for just their second ever provincial title against the shell-shocked Westmeath champions, yet another testament to the resilience of the team in their run to provincial glory. "It was the greatest feeling I have ever had on the football pitch. To win it in that way, such a big day for us and the club, it was huge," he told RTÉ Sport. "It’s something we will all remember forever. "It was crazy stuff. Against Portlaoise, we were three down with a couple of minutes to go and I thought that comeback couldn’t be beat. "Five points down in injury time is an incredible way to come back and win the game." Three Éanna O’Connor frees sandwiched a goal from Sweeney and he paid tribute to the role of centre-back, James Murray after a surging run and pass in the lead-up to the goal. "All I remember is James Murray coming in with a huge interception. He tried one before that and just missed it. At that stage he was right to and we needed something like that to try and open it up. "It was a great pass and the finish was the easy part. "I knew as soon as the goal went in we were going to win the game. And everyone else was thinking the same." "I did think that these days were over"
Sweeney played for Kildare for 13 seasons after making his debut in 2000, the same year he won his one and only Leinster title, but says this victory means more than the inter-county feat 17 years ago. "I didn’t really know what was happening in 2000," he says. "I think when you get older you savour it that little but more. I did think that these days were over. The 37 thing, it’s just a number. "The thing I like to focus on is the five 19-year-olds-that finished the game. The young lads we are bringing through are really good."